Models should represent the essential aspects of a system and leave out the inessential details. In this paper we propose an automatic approach to determine whether a model indeed focuses on the essential aspects. We define a new metric, structural essence, that quantifies the fraction of essential elements in a model. Our approach targets structural models, such as the prevalent UML class diagrams. It is inspired by the idea of algorithmic essence – the amount of repetitive constructs in a program – and the duality between behavior and structure. 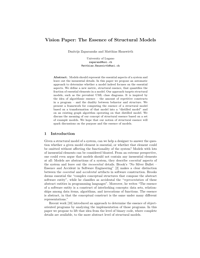 We present a framework for computing the essence of a structural model based on a transformation of that model into a “distilled model” and on an existing graph algorithm operating on that distilled model. We discuss the meaning of our concept of structural essence based on a set of example models. We hope that our notion of structural essence will spark discussions on the purpose and the essence of models.